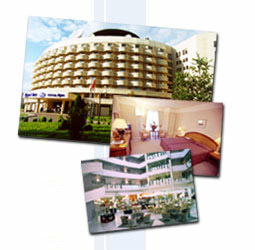 Since its opening in 1991, the Iris Hotel has firmly established itself as a leading first-class hotel renowned for its unique atrium-style architecture, individual character and warm, homelike ambiance with an informal touch. Situated in a quiet residential area midway between downtown Moscow and Sheremetyevo International Airport, our 8-storey hotel provides a comprehensive range of services and facilities to meet the highest expectations of the most discerning business or leisure traveller. Each of the 195 spacious guest rooms and suites offers an extensive array of amenities, including air-conditioning, in-room Internet access, satellite TV and minibar. Hotel facilities include an atrium restaurant, lobby bar, health club with gym, indoor pool and saunas, full service business centre and 8 versatile conference and banqueting rooms accommodating up to 300 delegates for business or social events. The Iris Hotel also leases office space and operates a 44-apartment residence suitable for medium- and long-term accommodation. The Iris Hotel operates a 44-apartment residence featuring Western-standard apartments suitable for medium- and long-term stay. Since its opening in 1991, the Iris Residence has established itself as one of Moscow's first and finest residential compounds.